Aaron Yoder is a Shenandoah Valley native, and attended Turner Ashby High School and Eastern Mennonite High School. Aaron graduated from Eastern Mennonite University with a BA in English in 2001. Aaron‘s passion for the built environment began at age 14, when his Dad drove him to his first construction job mixing mud for a local brick mason. 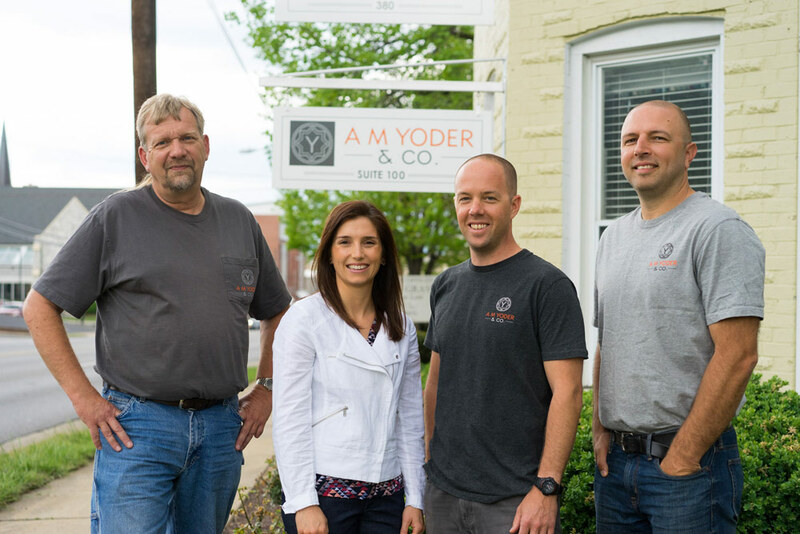 Through years of hard work and learning by hands-on experience, Aaron and his team have built A M Yoder & Co., Inc. into one of the region’s most trusted custom home building and remodeling design-build firms. Aaron‘s passion for the building industry and collaboration is key to developing a process that adds value to its clients’ projects. 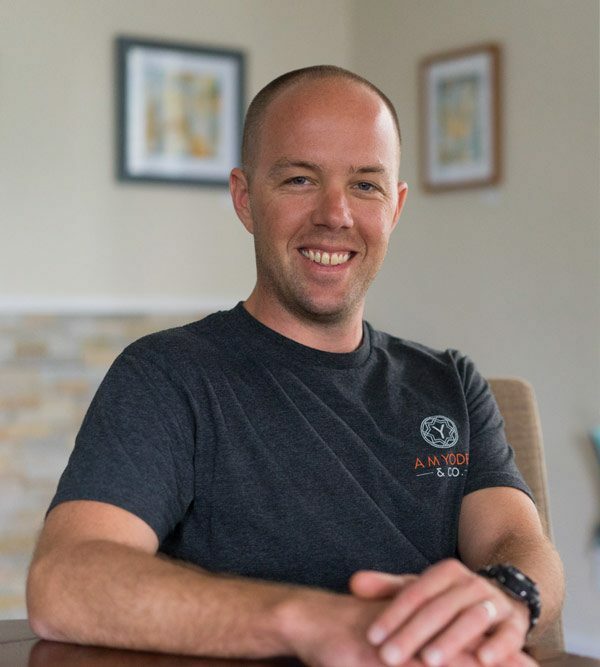 Aaron is a past president of the Shenandoah Valley Builders Association, serves on various committees of the Home Builders Association of Virginia, and participates in the National Association of Home Builders’ prestigious 20 club program as a club member and a Trustee. Aaron frequently gives seminars and presentations to trade groups to promote best practices and is recognized as a leader in the industry. Melinda Yoder also grew up in the Valley and attended Broadway High School and Eastern Mennonite University. Upon graduating with a BA in Social Work from EMU in 2001, Melinda worked as a Social Worker for Pleasant View, Inc. for four years. In 2006, Melinda joined her husband Aaron in the building industry, and began to assume a variety of administrative tasks at A M Yoder & Co., Inc. In 2015, Melinda further expanded her role to include Selections Management. 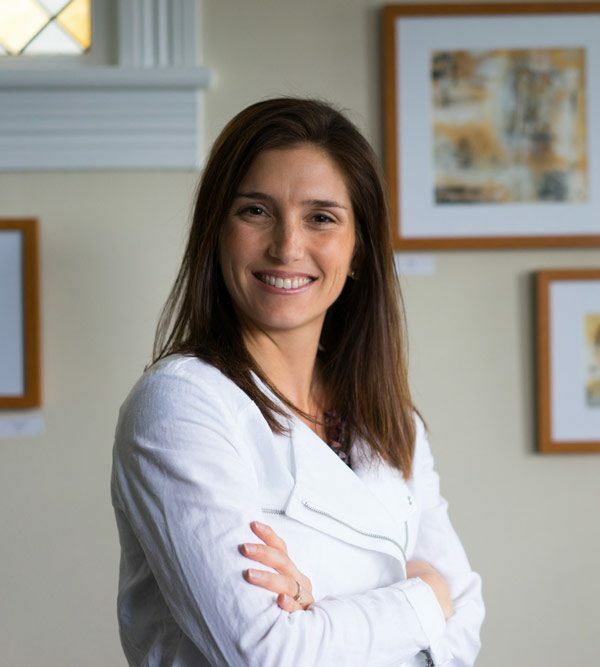 Melinda’s amazing sense of style and passion for the aesthetic quality of homes is a truly unique contribution to our process of walking with clients step-by-step through the designing, building or renovating process. Aaron and Melinda were married in 2001, live in Harrisonburg and have two children. 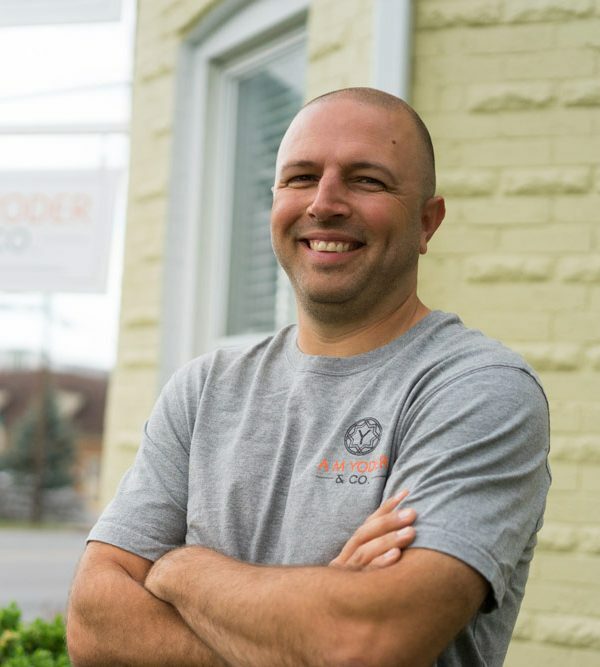 Nick joined A M Yoder & Co. in late 2009, bringing with him a wealth of construction knowledge and a passion for details to his role as Superintendent. Nick’s experience includes production and custom framing, all aspects of finish work including trim and cabinetry installation, production, showcase and custom home coordination and site supervision. From 2009 to 2015, Nick managed multiple projects, and helped cultivate a culture of collaboration among our trade partners and suppliers. 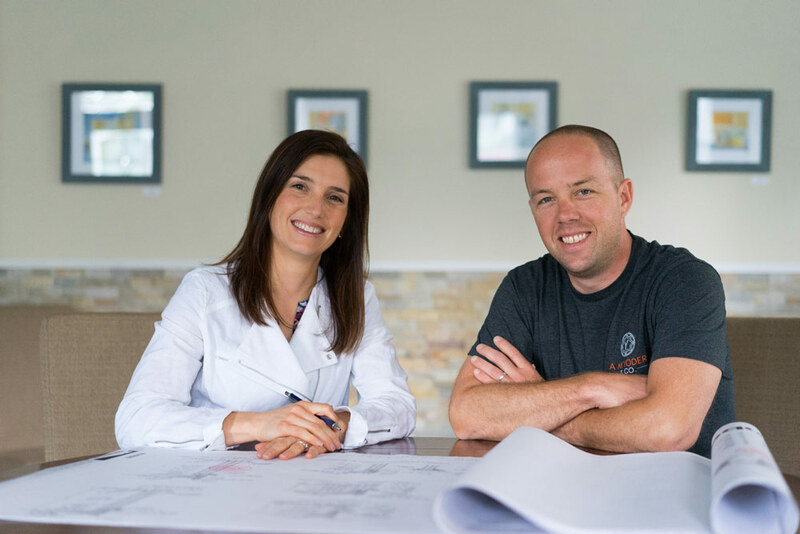 By working closely with each trade partner and supplier to schedule and organize daily site activities across multiple projects, Nick’s practical experience as a gifted hands-on technician was crucial to establishing A M Yoder as a premier custom home builder from the start. In 2016, Nick’s role evolved to even further leverage his unique skill set as a site Superintendent. By spending more time on individual custom home projects, Nick’s unrivaled abilities as a problem solver and technician give A M Yoder a unique 1-2 punch of management and hands on attention to quality that few custom home builders enjoy. Nick ensures that all phases of construction happen seamlessly on site. Nick lives in Luray, Virginia on the banks of the Shenandoah River and enjoys numerous outdoor hobbies, including sporting clays and target shooting. Troy joined A M Yoder in 2015 as a Project Manager. Troy‘s tireless passion for scheduling and organizing ensures that the entire A M Yoder team stays on track. Troy is responsible for seeing the big picture of each project, coordinating subcontractor scheduling, and purchasing materials. By keeping a bird’s eye view on the project, Troy ensures that critical benchmarks of ordering materials are met and busy trade partner schedules blend seamlessly together to keep the project on track. Troy also personally records meeting notes of each site meeting with each customer and distributes the notes, creating a historical context of the project from start to finish. Troy also creates a job log of each custom home and remodeling project, so that customers can see exactly how and when things like weather delays impacted their project. Finally, Troy updates Co Construct files daily to give our customers unparalleled access to the details of each and every project. 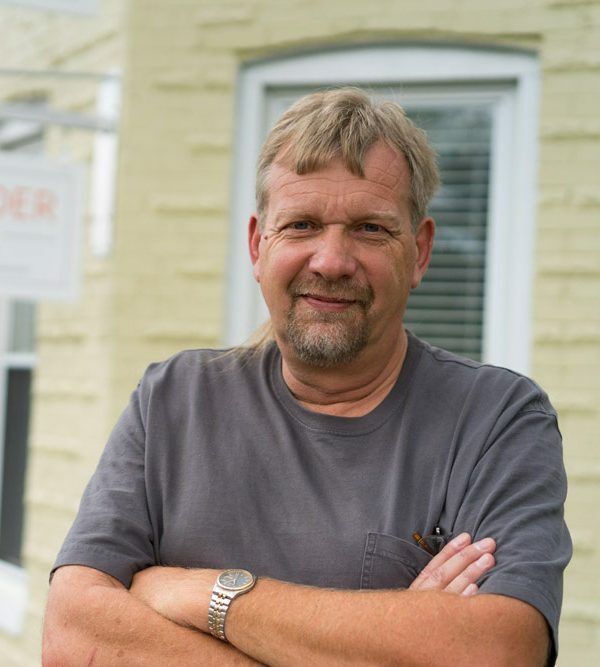 Troy’s past experience includes remodeling, and managing and coordinating construction projects of all sizes, including supervising work at the Urban Exchange, Harrisonburg’s largest multi-family housing building in downtown Harrisonburg. Troy lives in Harrisonburg with his family and also enjoys numerous outdoor activities, such as kayaking and fishing on the beautiful Shenandoah River.